Tons of rainbow trout have had to be rescued. They were living in a Central California fish hatchery. The fish were moved by truck to cooler lake water. The move saved them from the state's harsh drought. That is according to wildlife officials. About 80,000 pounds of trout were scooped up. The fish were taken from the San Joaquin Hatchery. It is near Fresno. They were taken 30 miles uphill. The fish went to Shaver Lake. The lake is in the Sierra Nevada foothills. Temperatures in Millerton Lake had reached nearly 70 degrees. It flows through into the hatchery on the San Joaquin River. The temperature risked the trout's survival. That is what the Fresno Bee reported. "The drought is having a devastating effect." That is according to Andrew Hughan. He is the California Department of Fish and Wildlife spokesman. "We are really making an effort to save as many fish as we can. And get them into cold water before it gets any warmer." The first round of trout was shipped by water tank. They were taken to Shaver Lake on Aug. 12. 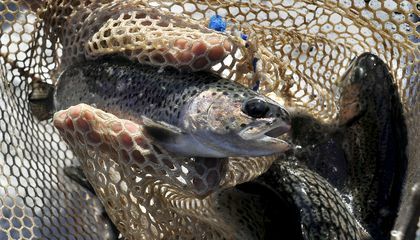 Another 50,000 pounds of trout will be moved to area lakes in Fresno and Madera counties. 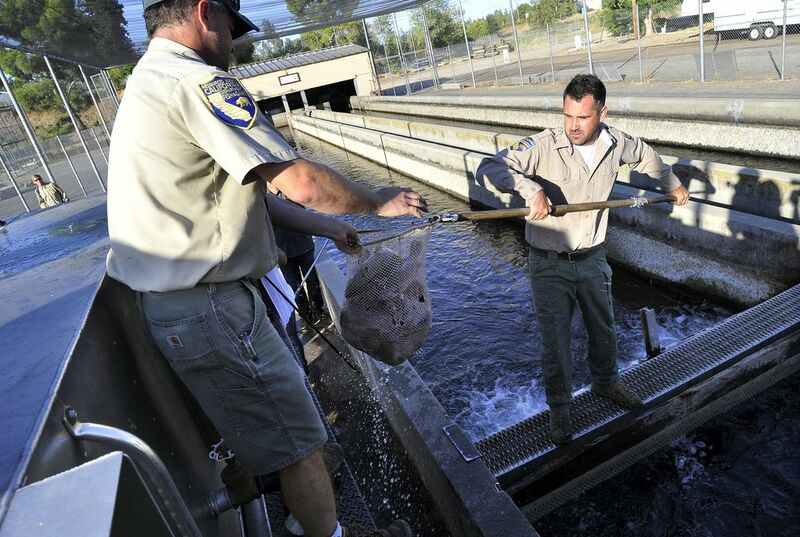 This marks the first removal of fish from the San Joaquin Hatchery because of the drought. Other California hatcheries have gone through it two years in a row. Wildlife officials trucked millions of young Chinook salmon from a hatchery near Redding in June. The fish were taken to the San Francisco Bay. It is 200 miles away. The drought ran down rivers that the fish normally use. They travel to the Pacific Ocean. Wildlife officials scooped up endangered Coho salmon too. They also saved threatened steelhead trout. This was in June. The fish were struggling to survive in shrinking tributaries to the Russian River. That's in Sonoma County. Why are the trout measured by weight? I think that it is life threatening to young fishes in the hatcheries because a lot of the hatcheries had been already warmed up from the global warming because of the global warming, the fishes from the hatcheries are moved to cooler lakes. The Hatcheries are going to be drained out because if the water is just left in the Hatcheries then it would be smelling bad if the water is left in the Hatcheries. The trout measured by weight because they collected all the fish together so they weren't going to count one by one so they measured them all together.